به‌منظور بررسی تاثیر زمان پخش و مقادیر کاربرد کاه و کلش گندم بر شاخص‌های مربوط به عملکرد بنه‌های دختری زعفران در سال دوم، آزمایشی در دو سال زراعی 90-1389 و 1391-1390 بصورت فاکتوریل در قالب طرح بلوک‌های کامل تصادفی با 15 تیمار و سه تکرار در مزرعه تحقیقاتی دانشگاه فردوسی مشهد اجرا شد. تیمارهای آزمایش بر اساس پنج سطح کاربرد مالچ کلش گندم (شاهد (عدم پخش مالچ)، 2، 4، 6 و 8 تن در هکتار) در سه زمان (خرداد، مرداد و مهرماه) به‌صورت پخش سطحی طراحی شدند. نتایج تجزیه واریانس در آزمایش حاکی از تاثیر معنی‌دار زمان پخش مالچ کلش گندم، مقادیر کاربرد مالچ و نیز اثر متقابل آن‌ها بر تمامی شاخص‌های کمی گل زعفران بود. بر اساس نتایج آزمایش، پخش مالچ کلش در مهرماه بیشترین تاثیر را در افزایش معنی‌دار تعداد گل در متر مربع و عملکرد گل‌تر و ‌خشک زعفران (به ترتیب تا 46، 61 و 65 درصد) داشت. هم‌چنین تمامی شاخص‌های مورد مطالعه بنه‌های دختری زعفران به‌طور معنی‌داری تحت تاثیر زمان پخش مالچ کلش گندم قرار گرفت. در بین تیمارهای مورد بررسی، بیشترین افزایش در عملکرد بنه‌های بیش از 12 گرم و عملکرد کل بنه‌های دختری زعفران در نتیجه کاربرد 8 تن مالچ کلش در مهرماه مشاهده شد. به‌طوری که کاربرد تیمار ذکر شده در مقایسه با شاهد، عملکرد بنه‌های با وزن بیش از 12 گرم و عملکرد کل بنه‌های زعفران را به‌ترتیب تا 104 و 103 درصد افزایش داد. In order to investigate the effects of different levels of applied wheat straw as mulch in different dates on flower characteristics and corms behavior of Saffron (Crocus sativus L.) in the second year, a field experiment was conducted as factorial layout based on a randomized complete block design with three replications at Faculty of Agriculture, Ferdowsi University of Mashhad, Iran in years of 2010-2011 and 2011-2012. The experimental treatments were all combination of different levels of wheat straw as mulch (0, 2, 4, 6 and 8 t. ha-1) based on surface applied method in three different dates (June, August and October). The results showed that the applied wheat straw as mulch in different dates had significant effects on flower characteristics of saffron (flower number, fresh and dried flower and stigma+ style yields). Based on these results, applied wheat straw as mulch in October had highest effects on increasing flower number, fresh and dried flower yields (by 46, 61 and 65%, respectively). In addition, applied wheat straw as mulch had significant effects on number and yield of replacement corms. The applied straw as mulch in October increased yield of replacement corms with 12 g or higher weight and total corm yield of saffron by 104 and 103 %, respectively, as compared to control treatment. Bastian, F., Bouziri, L., Nicolardot, B., and Ranjard, L. 2009. Impact of wheat straw decomposition on successional patterns of soil microbial community structure. Soil Biology and Biochemistry 41:262–275. Behboodi, B.S., and Samadi, L. 2004. The morphological study of amyloplast distribution in Crocus sativus L. fibrous roots. ISHS Acta Horticulturae 650 First International Symposium on Saffron Biology and Biotechnology: 49–54. Chen, S., Zhang, X., Pei, D., and Sun, H. 2005. Effects of corn straw mulching on soil temperature and soil evaporation of winter wheat field. Transactions of the Chinese Society of Agricultural Engineering 21: 171–173. Chen, S.Y., Zhang, X.Y., Pei, D., Sun, H.Y., and Chen, S.L. 2007. Effects of straw mulching on soil temperature, evaporation and yield of winter wheat: Field experiments on the North China Plain. Annals of Applied Biology 150: 261–268. Danga, B.O., and Wakindiki, I.I.C. 2009. Effect of placement of straw mulch on soil conservation, nutrient accumulation, and wheat yield in a humid Kenyan highland. Journal of Tropical Agriculture 47: 30–36. Du Prezz, C.C., Steyn, J.T., and Kotze, E. 2001. Long-term effects of wheat residue management on some fertility indicators of a semi-arid plinth sol. Soil and Tillage Research 63: 25–33. Ghorbani, R. 2006. The economics of saffron in Iran. Proceedings of the 2th International Symposium on Saffron Biology and Technology. Mashhad, Iran, 28–30 October 2006. 14 pp. Gresta, F., Avola, G., Lombardoa, G.M., Siracusa, L., and Ruberto, G. 2009. Analysis of flowering, stigma yield and qualitative traits of saffron (Crocus sativus L.) as affected by environmental conditions. Horticultural Sciences 119: 320–324. Kamkar, B., and Mahdavi Damghani, A. 2008. Principle of Sustainable Agriculture. JDM Press, 316 pp. Khan, I.A. 2004. Induced mutagenic variability in saffron (Crocus sativus L.). ISHS Acta Horticulture 650. First International Symposium on Saffron Biology and Biotechnology: 281–284. Limon-Ortega, A., Govaerts, B., and Sayre, K.D. 2008. Straw management, crop rotation, and nitrogen source effect on wheat grain yield and nitrogen use efficiency. European Journal of Agronomy 29: 21–28. Molina, R.V., García-Luis, A., Coll, V., Ferrer, C., Valero, M., Navarro, Y., and Guardiola, J.L. 2004. Flower formation in the saffron (Crocus sativus L.). The role of temperature. Acta Horticulturae 650. First International Symposium on Saffron Biology and Biotechnology 39–48. Molina, R.V., Valero, M., Navarro, Y., Guardiola, J.L., and Garcia-Luis, A. 2005. Temperature effects on flower formation in saffron (Crocus sativus L.). Sciatica Horticulture 103: 361–379. Monzon, J.P., Sadras, V.O., and Andrade, F.H. 2006. Fallow soil evaporation and water storage as affected by stubble in sub-humid (Argentina) and semi-arid (Australia) environments. Field Crops Research 98: 83–90. Nehvi, F.A., Lone, A.A., Khan, M.A., and Maghdoomi, M.I. 2010. Comparative study on effect of nutrient management on growth and yield of saffron under temperate conditions of Keshmir. Acta Horticulturae 850. Third International Symposium on Saffron: Forthcoming Challenges in Cultivation, Research and Economics: 165–170. Pandey, D., Pandey, V.S., and Srivastava, R.P. 1979. A note on the effect of the size of corms on the sprouting and flowering of saffron. Progressive Horticulture 6:89–92. Sadeghi, B. 1994. Effect of corm weight on saffron (Crocus sativus L.) flowering. Iranian Research Organization for Science & Technology (I.R.O.S.T.). Sadeghi, B. 1996. Effects of corm size on flower production in saffron. 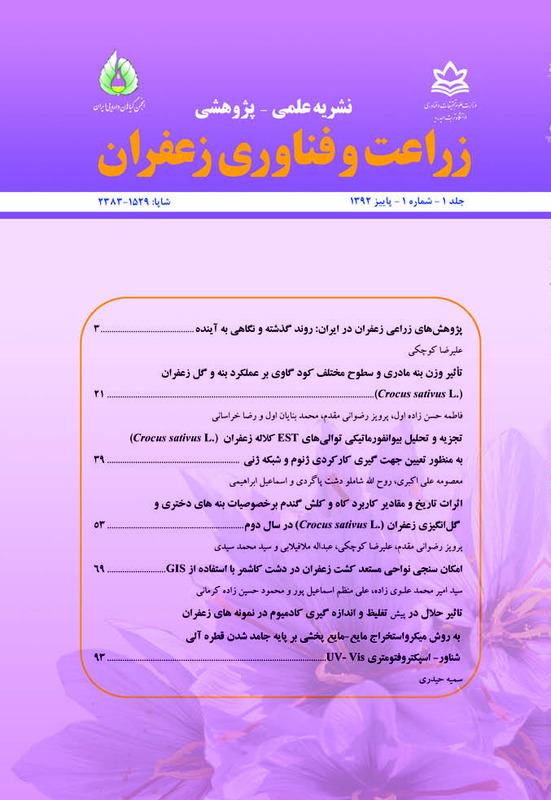 Annual Report, Scientific and Industrial Research Organization of Khorasan, Mashhad, Iran. Sadeghi, B. 2008. Sustainable cropping of saffron in Iran. Research Report. Research Institute for Food Science and Technology, Razavi Korasan. Sadeghi, B., Aghamiri, S.A. and Negari, A.K. 1997. Effect of summer irrigation on increasing saffron (Crocus Sativus L.) yield. Iranian Research Organization for Science & Technology (I.R.O.S.T.). Sadeghi, B., Razavi, M., and Mohajeri, M. 1987. Effect of chemical elements on saffron cultivation improvement. Khorasan Agricultural Research Center Pub. Singh Sidhu, A., Sekhon, N.K., Thind, S.S., and Hira, G.S. 2007. Soil temperature, growth and yield of maize (Zea mays L.) as affected by wheat straw mulch. Archives of Agronomy and Soil Science 53: 95–102.